This is a wonderful book! It's all about Daniel and how we can look to him as we have the courage to make the right choices in life. First of all, this is such a pretty book! It has a lovely blue cover and inside, the printing and artwork are also blue. It makes for easy reading but also is very eye-pleasing. For this reason, it would make a lovely gift for someone. Graduates would especially love this book as a guide to living their lives for the Lord, but of course, it would make a great gift for anyone. The book is all about twenty choices we can make that will impact our lives, and the lives of others, for the better. Making the hard choices, as Daniel did, is not always easy but it makes a huge difference in our walk with the Lord. I love how each chapter is short and easy to read. Yet, each one is so full Biblical wisdom that really gives us good direction for our lives. I like how she emphasizes the amazing life of Daniel and how we can look to him for inspiration. 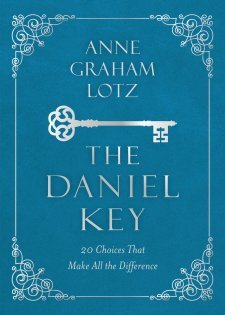 This is another wonderful book by Anne Graham Lotz and I highly recommend it. I give this book 5 out of 5 stars.